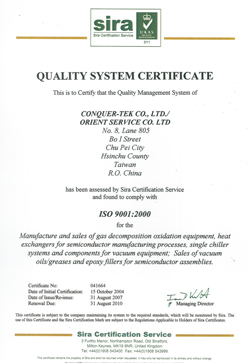 ISO90001 (2000 version) places emphasis on “customer orientation,” “process orientation” and “CIP.” This is also the guiding direction for Orient Service Co., Ltd.'s (OSC) management system. The biggest difference between the 1994 and 2000 versions of ISO90001 is the emphasis on top management involvement. The semiconductor industry incorporates precision equipment, qualified personnel and (good) environments. Our understanding of this leads to the most advanced equipment and prompt service process. Successful implementation of quality management systems can increase performance and customer satisfaction. It can also lead to improvement in productivity, efficiency, lower costs and increased market share. To obtain those benefits, OSC's corporate quality system must respond to the human side of the service equation; realize the impact and importance of products on the service team's image, culture and performance; develop the skill set of customer service, sales and manufacturing personnel; motivate customer service and sales staff to improve quality to meet customers' expectations.